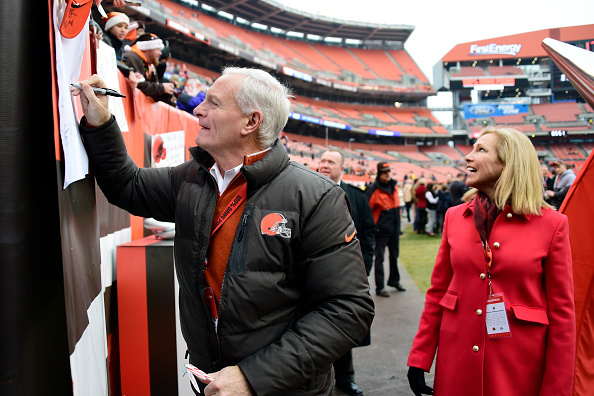 Say what you want about Jimmy Haslam, he at least wants you to know he’s sorry about the season the Cleveland Browns put forth last year. The team’s owner opened the offseason with an apologetic letter to fans and season ticket holders, thanking them for their loyalty during a miserable 1-16 campaign. Haslam claimed – shockingly – that nobody was happy with last season and vowed to improve moving forward. This alone would’ve been enough, I guess. Not that anyone believed he felt as though this past season wasn’t that bad. Still, it was a nice gesture to ensure the fans knew winning one lone game was anything but acceptable. However, apparently Haslam wasn’t done. He and his wife, Dee, released another letter today to continue pushing the “we’re going to be better” narrative. It was coupled with an announcement Cleveland was lowering ticket prices, which is essentially a necessary move after last year. What made today’s note different was what else was included besides thanking fans for sticking with the team. Reading Haslam’s note, it sure sounds like we should expect a busy offseason from his team. Heck, for all intents and purposes, he said as much in the second paragraph. Sure doesn’t seem like there’s much grey area there, does it? Haslam comes right out and says the front office has set it up so the team can go out and improve a roster in dire need of better talent, and can’t just leave the money it’s piled up in cap space unspent. That said, is Haslam calling his shot or is he just saying the right things to reengage fan interest? You certainly wouldn’t fault him for the latter. Positive Browns fans are tough to come by these days, even with the team owning two first-round draft picks. As a result, Haslam needs to say whatever he can to convince supporters things will get better. Claiming the team plans on using its astounding amount of cap space to improve the roster certainly helps the cause. Still, it seems significant Haslam would specifically address the concept of being aggressive in free agency. This is especially so when you consider how little Cleveland did this time last year. Are we to believe the Browns have gotten their quiet offseason out of the way in the previous winter, and are now ready to be big spenders? It should be noted Haslam used the term “appropriately aggressive.” Hopefully this means the Browns aren’t going to spend every last dollar of their salary cap in the next month or two just for the sake of doing so. Cleveland isn’t a team which is one free agency shopping spree away from being a contender. At the end of the day, though, the Browns avoided making even the slightest splash in free agency last year as part of their plan to rip the roster down to the studs. Based on Haslam’s note, we should expect things to be different this time. You’d think this would be true when you consider what these statements do for the front office. Here we have Haslam highlighting the sizable salary cap, also claiming the team has to actually take advantage of it. Bringing this up certainly lights a fire under his staff. If another winter of minimal spending and lack of activity follows this letter which insists things will be different, how are we supposed to react? We’ll cross that bridge come March 9 when free agency officially opens. Based on the words of Cleveland’s owner, that’s the day we’re supposed to believe the team will hit the ground running in attempts to acquire players. If this doesn’t happen, though, Haslam’s words will certainly seem hollow. Sadly, if you’re a Browns fan, such a concept is just par for the course.